I have a longstanding habit of visiting my garden first thing in the morning with coffee in hand and waking up amidst the fresh scents of rain, earth and herbs. It’s a brief moment of stolen solitude, before I return to the clamour of hungry kids in the kitchen as the day takes off to a roaring start. Just the other morning, I slung my camera over my shoulder and attempted to capture the garden with its sprinkling of morning dew among the waving pea tendrils and rows of carrots. A recent back injury (which was indeed confirmed as a herniated disc) considerably slowed down my gardening efforts this June. And so although they are not my prettiest raised beds to date, I am enormously proud of all I accomplished in spite of my limited time there. I know it’s technically been summer for a few days now, but today’s post is a snapshot of what’s been growing in my garden all spring. Enjoy! Much of this green glory I owe to the spectacular weather we’ve been having. We’ve been blessed with just the right amount of sunny days interspersed with periods of intense rain. The raised beds have been soaking it all in, and thriving, despite their late start. Above are Mateo’s beans-in-a-barrel, which he planted and then watered so thoroughly I was sure the seeds would rot. Somehow, they sprouted and grew, confirming my theory that pole beans are excellent specimens for young gardeners. It’s all about the tender lettuce greens these days. 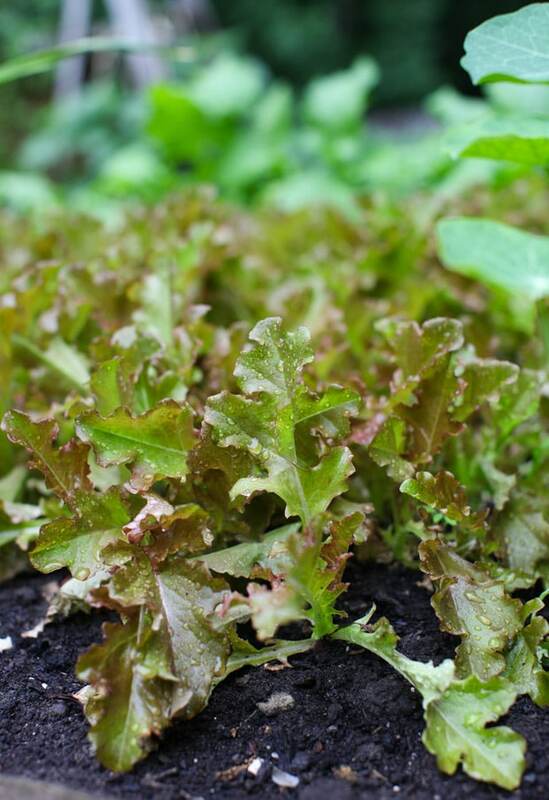 I always grow red oak leaf lettuce, as much for its butteryness as for its pretty looks. I scatter the seeds in big patches, and then thin for salads every couple of days. They will bolt and turn bitter with the late July heat, so we are eating as much as we can now. Each year I seem to improvise different staking methods and this spring my young dill is fastened to old headless croquet mallets. My neighbour was throwing away a whole bucket of them, so I rescued and repurposed them. I rather like the colors they bring to the garden. I have high hopes for this dill. We’re a family that adores pickles and every last flowering dill head this patch produces is predestined for a pickle jar. For the first time, I’ve dedicated a whole raised bed to kitchen herbs, so it will be interesting how they do (or don’t). I go through a lot of herbs over the summer; in salads, various pestos, pickles (as I mentioned), herbal cocktails, flavoured salts…and on and on. 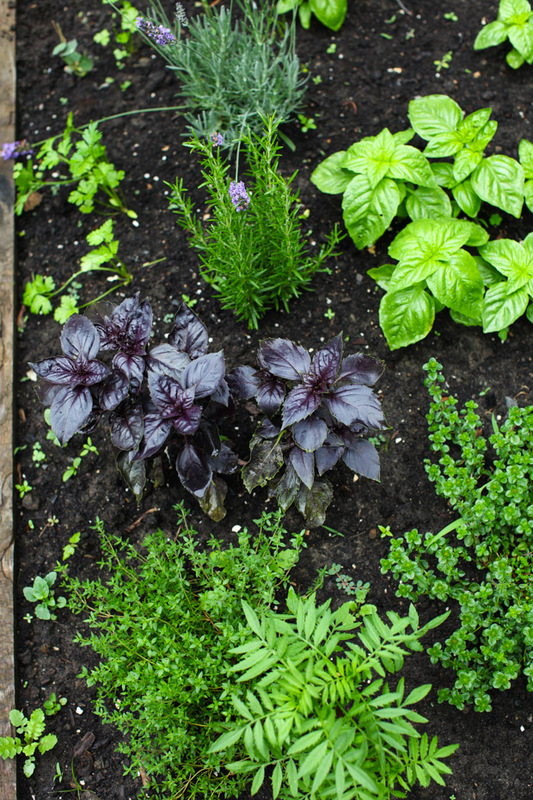 I’m envisioning a thriving patch in August and all the herbs I can dream of eating. Time will tell! So far the squirrels have been trimming my parsley down to stubs every evening, but everything else seems to be happy and unmolested by rodents. 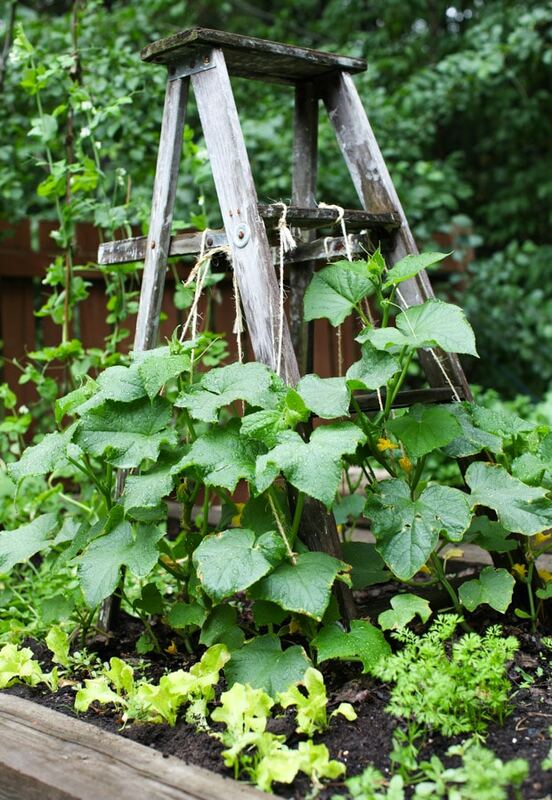 This vintage ladder-turned-trellis is one of my old stand-by garden features and I’d delighted at how my cucumbers have taken so well to their home. I suspect it is all the rain, but this is certainly looking promising for future pickling projects. (Yes, I have a one-track mind). In the bottom right, you can see the corner of Noah’s carrot patch. They are still very tiny, but the July sun will change that soon enough. We can never plant enough carrots; they are one of the vegetables that seldom make it to the kitchen because the kids eat them all raw, straight from the dirt. 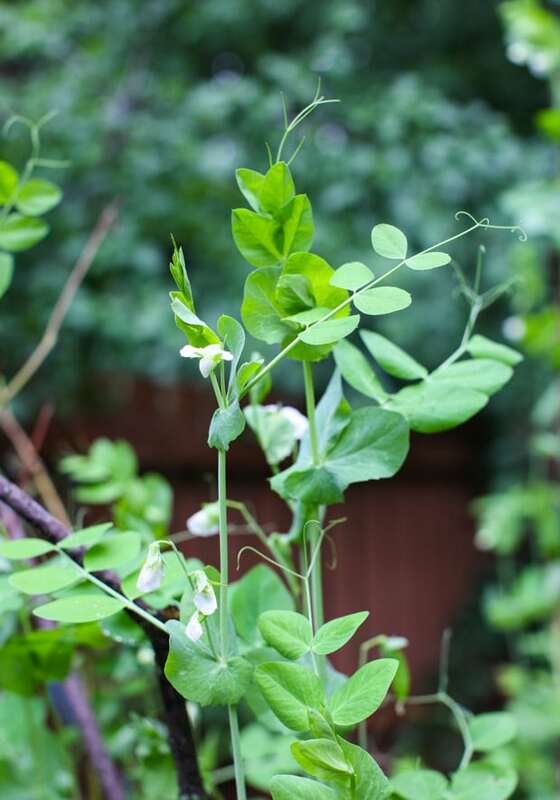 Clara’s peas are now taller than her and producing their pretty white flowers. She can hardly wait to eat them from the shell and I can’t wait to make our favourite early summer risotto. We could probably plant the entire garden with just peas and still not harvest enough for the freezer, but a corner will have to suffice until we buy a farm. A fall planting of garlic yielded tall green shoots this spring and now a crop of garlic scapes are ready for harvest. I loved how these two were getting cuddly – and formed a heart in the process. I grill my scapes to serve as a side to steak, and bake them into pizzas. I also chop kale and scapes for a summery tabbouleh with tomatoes, mint and cucumbers. Basically they can be used in place of garlic. Delicious! This bountiful kale patch just won’t be downtrodden, despite numerous attacks from my wayward chickens. I’ve never been able to grow decent spinach, so kale is my predominant garden green. It gets wilted, stewed, sautéed, blended, chopped, stir-fried, massaged and munched raw right off the stalk. It’s incredibly easy to grow and will be on our table until October. 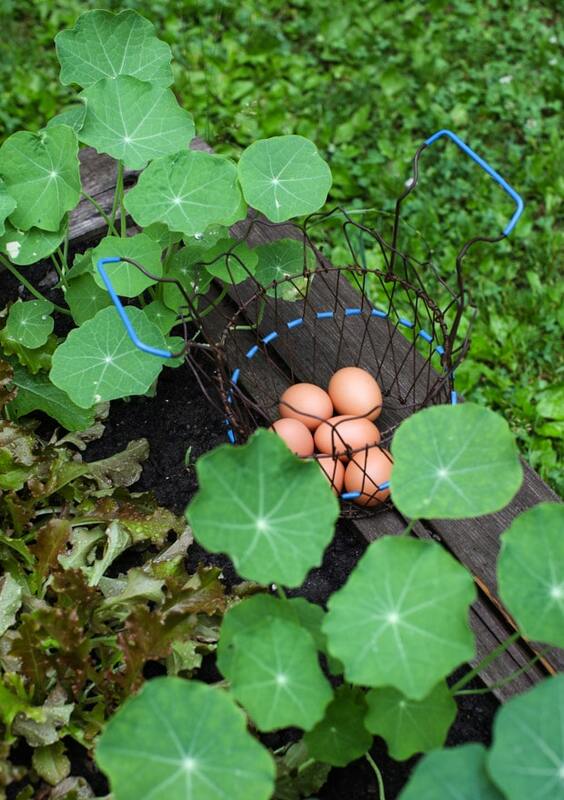 Our backyard chickens may need to learn their boundaries, but collecting six brown eggs every morning never gets old. Clara is our resident chicken maid and still thrills in checking the nests for warm eggs. There is plenty more that I didn’t show: a row of tomatoes in pots alongside the house, the late blooming zucchini plants, the budding raspberry patch, carrots, rhubarb, strawberries and more…but I think this post is long enough! I’ll try to do a late summer update, but it will be mostly a jungle by then. Things get out of hand when we travel in July and I tend to let things slide in August. But stay tuned to my Instagram feed for produce photos throughout the summer. 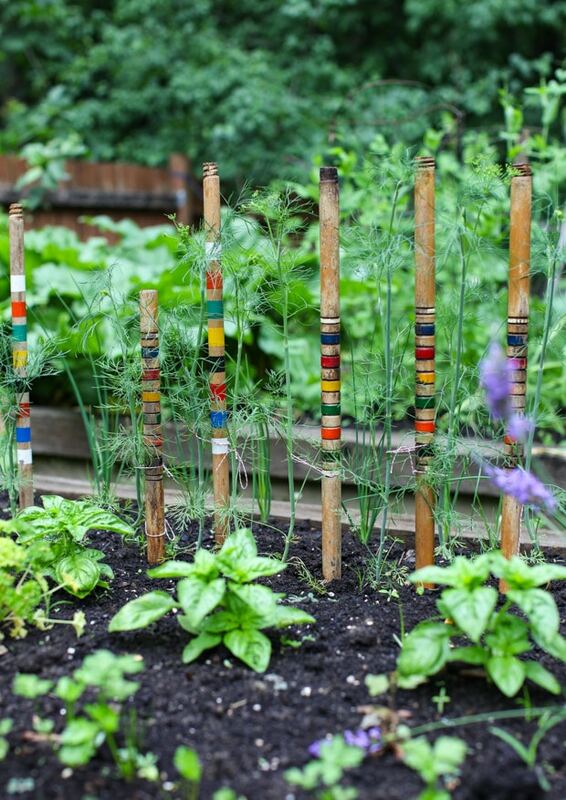 What is growing in your June gardens? What a fabulous garden. I’m going to pinch your idea of stepladder and croquet mallet handles for supports (if I ever come across a bunch of croquet mallet handles going spare). Thanks, Anne. I’m happy to inspire your gardening efforts! I hope you’ve recovered from your herniated disc. I dealt with that last year and it progressed through rest, PT, and injections, and finally was resolved by surgery and a lot of recovery PT…and time. For those whose disc issues aren’t too terrible, PT is definitely the route to go. It’s a slow recovery. I’m starting PT soon. Thanks for the encouragement. hey girl love the post! Your garden looks so good! great job! I just shared a similar look at my garden, but yours is so much prettier. 😉 What variety of kale do you grow? 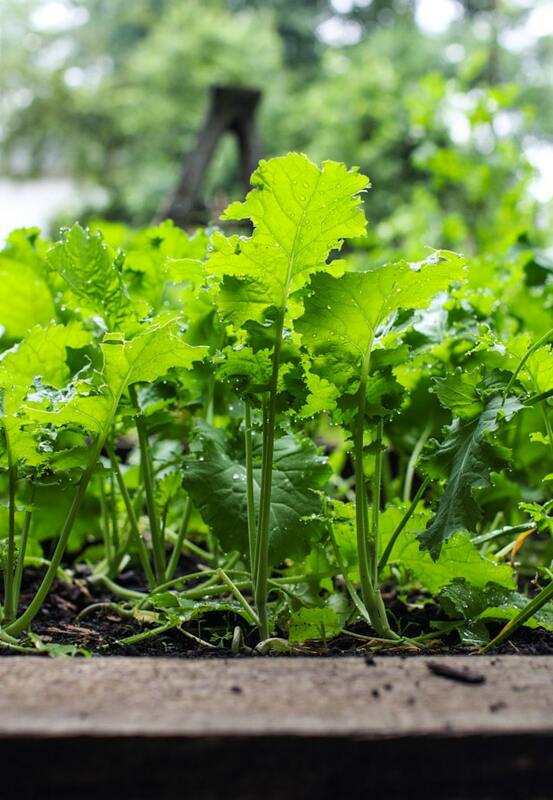 Do you start from seed, and if so, where do you get your kale seeds. I have some kale seeds to try this year, but they apparently don’t do well in summer heat so I’m saving them for the fall garden. I’d love to have kale that is available all summer long though. I adore these garden tours! 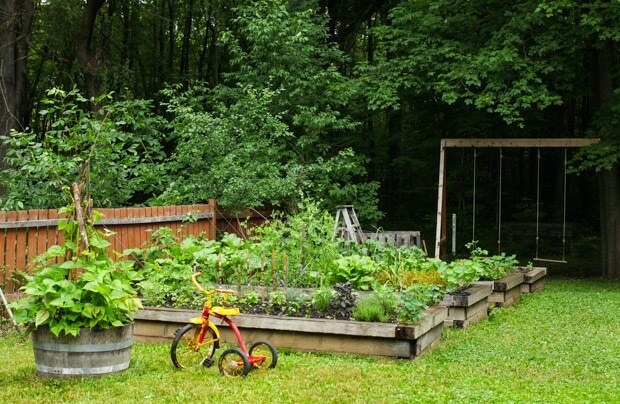 I love how lush and accessible your garden is for your kids! It’s what I am working hard to get mine to be. I keep having problems with getting my carrots and beets going. Do you have any tips for them? I keep planting them every year and keep switching the beds to get the sun/moisture right, but I never get more than 1 or 2 beets to germinate a year, and I’ve never had more than 2 carrots in 3 years. I remember carrots and beets being the easy ones for my mom in our massive garden, I’m not having luck though. Fantastic gardens! i love the ladder trellis, great idea, thanks so much for sharing! I’m so sorry about your back though. It’s such a bummer but at least the kidlets are great helpers! “It’s a brief moment of stolen solitude.” So much yes. My favorite part of the day is being outside in the early morning watering our vegetable garden. Those words describe it perfectly! Your garden and pictures are beautiful! What a lovely space you have, and you seem to be taking care of it so well. I love the croquet mallet handles too ! 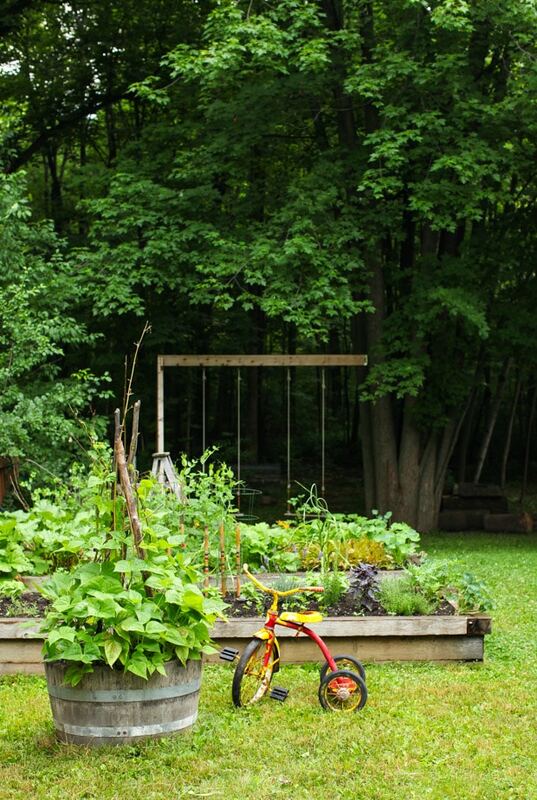 It was such an inspiring and helpful post for me … it gave me the right motivation to work on my tiny veggie patch here in Niagara. Thanks so much ! and feel better soon ! 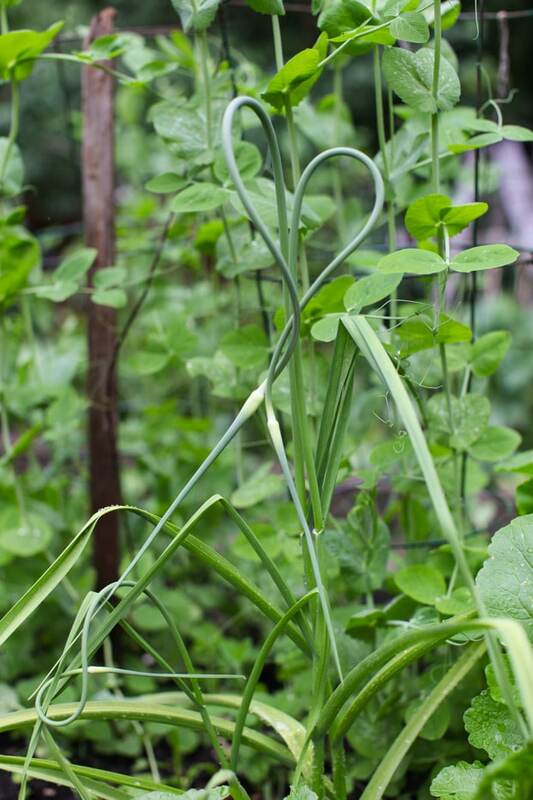 I’m loving all the gorgeous photos of food grown with such care. Gardening is a lot of work but well worth the effort. Gardens are the essence of beauty and life. Your garden is beautiful. I’d love to see the tomato pots. In my years as a reader I have always wondered how you keep out pests without fencing. I’m sorry if I missed that somewhere– but how do you?